This Christmas cake tastes so good that your guests won’t even know it’s gluten free! 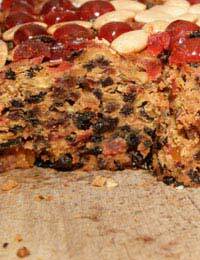 Begin 24 hours before you want to cook the cake, by soaking the dried fruit and cherries in the rum or sherry. On the day, line a 23 cm cake tin with baking parchment, and preheat the oven to 160°C or gas mark 3. Mash the banana and then purée it with the egg yolks. Set aside. Cream the butter and sugar together and the add the purée to this mixture. Add the flour, a spoonful at a time, folding it into the wet ingredients before stirring in the fruit and its liqueur with the honey. Set aside while beat the egg whites stiffly to a soft peak stage before folding them into the main mixture. Cook in the centre of the oven, for around two and a half hours. After one hour, check the top of the cake and cover with baking parchment if its browning too much. Check every 45 minutes thereafter, using a skewer to see if the mixture in the middle of the cake is fully cooked. Keeps for three weeks in an airtight box or tin. These pies require a little more care in the making and storage, but really compete well in terms of flavour. They are very good served with vanilla ice cream. Sieve the three flour ingredients, with the cinnamon and xanthan gum, into a large mixing bowl. Add the margarine and cut into the flours with a knife. Stir in the sugar, add the egg, mixing together with the knife. Now use your hands to bring the pastry into a soft ball. Gently knead the ball into a flattish round, wrap in plastic wrap or put in a bag and put in the fridge for at least thirty minutes or preferably overnight. Preheat the oven to 200°C or gas mark 6 and set out two mince pie trays. Take the pastry from the fridge and roll it out – many people find this easier to do between two sheets of baking parchment. Cut out rounds when the pastry is around 3 mm thick and then chill them, in their tins, for around fifteen minutes. You will have leftover pastry which you should put back in the bag without compressing it into a ball. Take the tins from the fridge and put a teaspoon of mincemeat in each case. Use the remaining pastry to make strips that you lay over the top of each pie and then bake for between fifteen and twenty minutes, or until pastry is light gold. Will keep for two days in an airtight box or tin. made the gluten free apple pie receipe for my sister-in-law,she loved it so did the rest of the family. so easy, i recommed you try it for yourself.